A man has been airlifted to hospital after falling from cliffs in Aberdeenshire. The man, thought to be in his 50s, fell around ten metres from the cliffs near Portsoy on Monday evening. Emergency services including police, coastguard teams and an RNLI lifeboat were called to the scene at around 6.30. 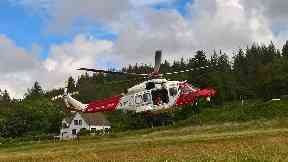 A coastguard helicopter was deployed to rescue the man, who was then flown to hospital. His injures were described as "non life-threatening".